Shibui: The beauty revealed by the passage of time. This word reminds us to appreciate the things that improve with age. Mugon-no gyō: A meditation that asks you to take a moment to reflect before doing – act, don’t react. Fukinsei: Beauty in asymmetry. Symmetry represents perfection, and is alien to human experience. An art form must bring a sense of alternative possibilities, admitting change. Teinei: A courteous attitude, where each gesture is performed with dedication and precision. Behaving with the utmost care in order to show excellence in your conduct. Shōganai: Meaning literally “there is no means or method”. Shōganai is a reminder that sometimes we have to accept things as they are, allowing us to let go of negative feelings. Kodawari: Determined and scrupulous attention to detail. Motivated by a sincere passion and self-discipline, knowing that some of these efforts will go unrecognised. Yūgen: Prizing what’s mysterious and profound. Yūgen is a kind of beauty that derives from understatement. Deeply tied to kanso, a reminder to perceive beyond what one sees. I like these. I wouldn’t say the concepts are foreign to me, but wrapping them up in a word or a phrase places emphasis on them, and perhaps can shape the mindset of people who use the words often. Culture shapes language, but language can also shape culture. In that first paragraph, the author of the book is quoted as saying, “In the West we tend to seek perfection.” Do you think that’s just a Western trait? Look at kodawari or teinei above. There’s some “utmost” going on there. I think humans everywhere seek perfection. Is perfection bad? In one way it is because humans are imperfect, so it’s unrealistic. In another way I think it’s good because it gives us something to shoot for. Maybe a better way of saying “seeks perfection” is “works towards a goal or a dream.” Even if the dream is never attainable, it’s worth having. Hopes and dreams are what propel us! Like most things, the healthiest place is somewhere in the middle, where we work towards goals that are realistic, and where we promote behavior that helps us get along but not at the expense of uniqueness. Kintsugi is the Japanese art of repairing broken pottery with lacquer dusted or mixed with powdered gold, silver, or platinum. As a philosophy, it treats breakage and repair as part of the history of an object, rather than something to disguise. 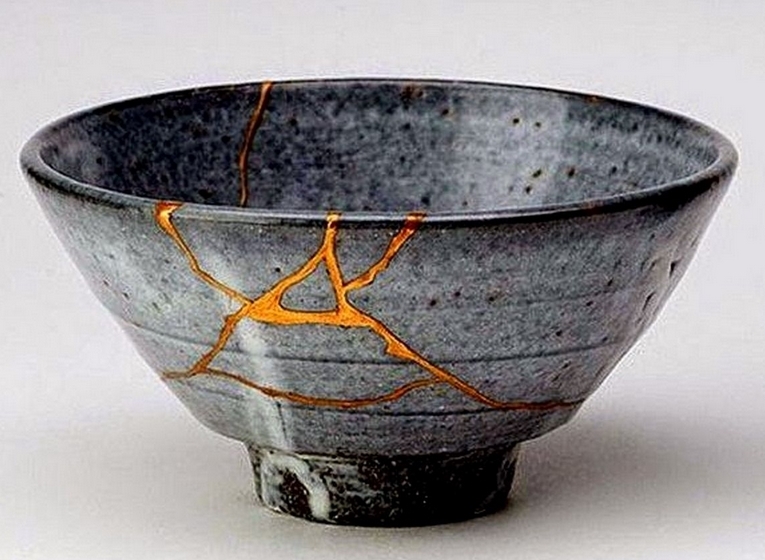 Kintsugi is similar to the Japanese philosophy of wabi-sabi, an embracing of the flawed or imperfect. Overall, I agree with and really love the values embedded in this essay. I only wish our politicians strove for perfection and service/kindness to other people, especially their constituents! I have to say … I’m excited to see all these Democrats coming forward to run against Trump. So many talented people with good ideas. I just hope it doesn’t devolve into a fighting match. When I was writing this it occurred to me that each of these words or phrases would lend itself to being the focus of a meditation. But I don’t meditate. But … why not?